One of the best things about the Niagara region is its agriculture. Virtually everything grows in this fertile area which is great news for local residents and also makes for delicious farm to table dining. While most of these farms are large scale operations some are more of the family farm variety and one of the best things about these farms is harvest season, especially when that means you can pick your own fresh fruits and vegetables. The country roads throughout the Niagara region are dotted with signs advertising a variety of produce that you can pick but the real treat comes as summer ends and the glorious weather of fall begins because this signifies apple season. With the perfect growing climate and conditions, apples are one of Niagara’s most treasured and profitable crops. Here you’ll find macintosh, red delicious, and empire apples in abundance as well as a few other lesser known varieties. 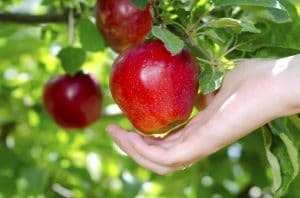 So on your next trip to Niagara Falls hop into the car and head for one of Niagara’s many apple orchards for a day of delicious fun the whole family will enjoy. Just north of the falls and popular with pickers throughout the year, Parkway Orchards has been one of the favorites in the region for years. 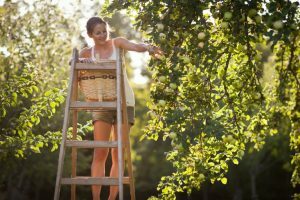 During other times of the year cherries, apricots, and other fruits have pickers lined up but September sees the real action with the start of the apple harvest. Their hours are 11 a.m. to 5 p.m. on weekdays and 11 a.m. to 6 p.m. on weekends but these times may vary due to weather. Be sure to check their website for current information. Parkway Orchards also offers picked and cleaned fruit for easy pick up, homemade pies, and other treats in their gift shop. Another of Niagara’s most beloved apple farms is Windwood Farms, located just a little ways north east of Niagara. A true working farm in the sense that you won’t find petting zoos or hayrides here, Windwood prides itself on the quality of its product and their commitment to excellence. Windwood grows over twenty varieties of apples and picking starts in September. A member of their staff will give you a quick lesson in the proper apple picking technique then you’re free to wander the orchards and chose your favorites. Windwood is currently only open on weekends but check their website for updated hours of operation. Three generations of the Mathias family have seen this far flourish over the years and in addition to providing high quality berries and other fruits to local residents and restaurants their pick your own business really ramps up during apple season which tends to begin in September. As a smaller scale operation their fruit is often picked out and sold rather quickly so if you want your choice of the best apples it’s wise to contact them through their website, check what’s available, and make an appointment for your picking session. There’s little that’s more quaint and satisfying than picking your own fruits fresh from the tree. Apple picking in this part of the world is a yearly tradition for some families so why not join the fun on your fall vacation to Niagara Falls.